Today was the day. I absolutely needed chocolate. No getting around it. You know those days. There’s nothing else you’re going to eat that’s going to take care of a chocolate craving. To remedy my chocolate craving I adapted a recipe I found in a Better Homes and Gardens All Time Favorites Cookbook (Volume 2). The recipe called for maraschino cherries, but since I don’t particularly care for maraschino cherries, and I wasn’t really craving anything but chocolate I simply left them out of the equation. Here is my adapted version of their recipe. These have four doses of chocolate in them! Preheat the oven to 350 degrees. I actually set mine to 325 degrees because I think it tends to run a bit warmer than it should. In a mixing bowl, mix butter eggs, sugar. Add baking soda, powder and salt and vanilla. Add cocoa, and then add flour. Mix well, and fold in mini chocolate chips. Drop onto slightly greased cookie sheets and bake for 10 minutes. Be careful not to over bake. The edges should be firm, but not too dark. Cool on the cookie sheet for 1 minute and remove onto baking rack. I’d like to happily report that my craving has been satisfied. 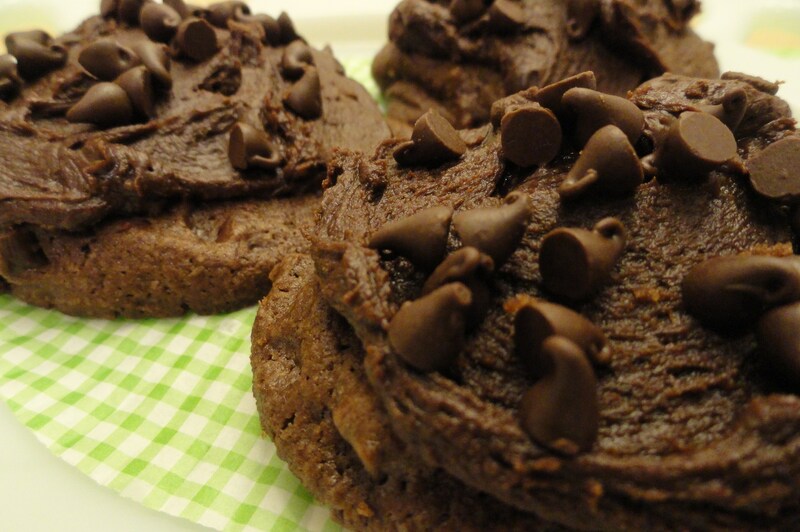 But then again why wouldn’t it be with a quad-chocolate cookie! *Note – To keep fresh store in air tight container. Best if eaten while fresh. I am in need of chocolate…all the time! We both made some great chocolate cookie recipes, and even now at eleven at night, I’m wishing I had a fresh plate in front of me! I think this sums up my reaction to these cookies perfectly: Yes, please. I totally know those “i need some chocolate NOW days”. What a perfect cookie for it. Thank you for sharing @ Prairie Story Recipe Swap! Oh that frosting just shot these cookies into the stratosphere! What a wonderful chocolate fix those must be! This is some serious chocolate. I’m sure it didn’t disappoint your craving. Looks heavenly!